"Look to the cookie." Remember that Seinfeld episode where the black and white cookie led to the end of Jerry's vomiting streak? While this post was started with mention of vomit, I promise these cookies won't make you vomit. Though, for liability purposes, the lawyer in me thinks I should disclaim any warranty or guarantees associated with the cookies. Okay, I looked to the cookie, and I'm focusing and back. 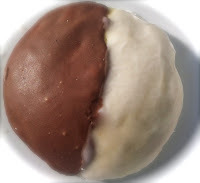 A black and white cookie is a soft, cake-like cookie which is frosted on one half with white frosting and the other half with chocolate frosting. It's seen as a New York treat, and they were baked in Utica, New York at Hemstrought's Bakery in the early 20th century. In Germany, these cookies are usually completely iced with either the plain white or the chocolate frosting, and they are called Amerikaner. These cookies are soft and cake light, with a hint of lemon flavor. You can never go wrong with frosting, and the frosting adds the perfect sweetness. Most black and white cookies are big, so I made a combination of big and smaller cookies. The small cookies were about 3 inches in diameter, and the big cookies were about 5 inches. Preheat oven to 375ºF. Line two baking sheets with parchment paper or silicone mats. In a medium bowl, combine the cake flour, all-purpose flour, baking powder, and salt. Whisk until mixed, and set aside. In a large mixing bowl or stand mixer, combine sugar and butter. Mix until fluffy. Add eggs, milk, vanilla, and lemon extracts, and continue to mix until everything is evenly combined and smooth. Next, add the dry mixture to the wet in batches, mixing well after each addition. Using a soup spoon, place heaping spoonfuls of the dough 2 inches apart on the baking sheets. Bake until the edges begin to brown and rotate the pans halfway through the baking, with a total bake time of18 to 20 minutes. Cool completely. Place the confectioners' sugar into a large mixing bowl. Gradually stir in enough boiling water to the sugar to make a thick, spreadable mixture. If you add too much water, just add more confectioners' sugar so that you achieve that spreadable texture. Place half of the frosting into the top half of a double-boiler or a heat-proof bowl that can fit over a pot. Add the chocolate, and set over simmering water. Warm the water, and stir until the chocolate is melted and smooth. Turn off the heat, but leave the chocolate frosting over hot water to keep it spreadable. Add vanilla to the plain frosting and stir. With a brush, coat half of the top of each cookie with chocolate frosting and the other half with the white frosting. Allow to dry and store in an airtight container. * I did not have lemon extract, so I substituted lemon zest from half of a lemon. Note: Because these cookies are more cake like, they will dry out faster, so these are best within a day or so of baking. Be sure to store them in an airtight container. I like black and white cookies!